Hello, I am French (sorry for my text). I wonder if we can block a layer. I would remove the "eye" so that one can not disable a layer. Thank you a lot. Bonjour, je suis français. J'aimerais savoir si on peut bloquer un calque. J'aimerais enlever "l'oeil" pour que l'on ne puisse pas desactiver un calque. Merci beaucoup. Are you talking about OpenLayers or Leaflet? Or something completely different? 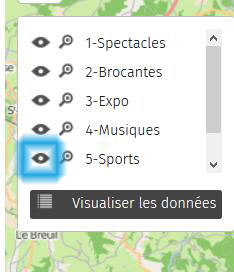 or about uMap (there is an "eye" in the layer selection)? Excuse me for these English words. I created "Spectacles" layers "Brocantes" that the user can activate or not. I would like the layer "Sport" is blocked and that we do not disables with the "eye". Can we make disappear "the activate eye" into the "blue square" ? It seems the maintainer is living in France (if I am not wrong), thus speaking french quite well, I hope. @stephan75: ybon is also active here on this site. For me this place is fine.